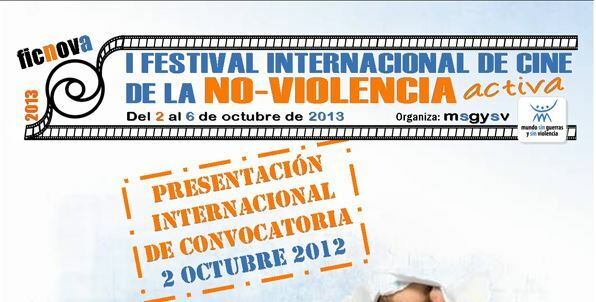 Some thirty cities in the continents of America, Africa, Europe and Oceania will celebrate the 1st International Film Festival of Active Nonviolence (FICNOVA in its Spanish acronym). FICNOVA, promoted by the humanist organisation World without Wars and Violence is aiming to create a space of coming together, of free creation committed to the culture of nonviolence. In different cities FICNOVA will be promoted with diverse activities that will culminate in the days between the 2nd to the 6th of October, 2013, with showings of selected works. More than 30 cities and countries have confirmed their participation in the 1st Active Nonviolence Film Festival: Sydney (Australia), Mexico and Bolivia in America, Nouakchott (Mauritania), Kisumu (Kenya), Yenegoa, Asaba, Calabar, Uyo, Akure, Oshogbo, Abuja, Kano, Bauchi, Jos, Kasina, Zaria, Illori, Owerri, Aba (Nigeria) and Cadia, Castelldefels, Coruña, Fuenlabrada, Madrid, Málaga, Murcia, Sevilla, Valencia, Vigo (Spain ) will celebrate FICNOVA between the 2nd and 6th of October this year, contributing a diverse vision on the possibilities for nonviolence. The competition is open for entries and has been presented publicly in Spain. In different latitudes film collectives, artists, anti-violence organisations, education centres, universities and institutions are being invited to participate. Local teams are promoting the festival through the organisation of debates, university seminars, active nonviolence video production workshops, film showings… The activities will converge between the 2nd and 6th of October with the projection of films selected by the different cities.